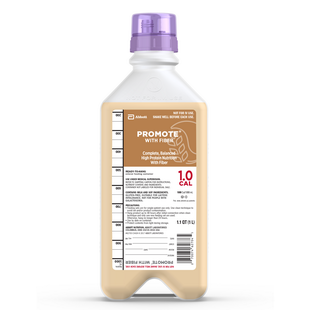 PROMOTE WITH FIBER is a complete, balanced, high-protein, and fiber-fortified formula for patients who need a higher proportion of calories from protein. It is ideal for patients with low caloric and/or wound-healing needs and those at risk for protein-energy malnutrition or pressure ulcers. For tube or oral feeding. For supplemental or sole-source nutrition. Use under medical supervision. High in protein (25% of Cal, 14.8 g/8 fl oz) from sodium and calcium caseinates and soy protein isolate. Protein is needed for lean body mass maintenance and repair. Fiber blend of 85% oat fiber and 15% soy fiber to provide a product with a good source of dietary fiber (14.4 g/L) but low in viscosity. Fiber helps moderate bowel function. * 3.4 g of total dietary fiber from oat and soy fiber. † 530 IU of vitamin A activity supplied by 0.4 mg of beta-carotene. * 14.4 g of total dietary fiber from oat and soy fiber. † 2250 IU of vitamin A activity supplied by 1.7 mg of beta-carotene. * 21.6 g of total dietary fiber from oat and soy fiber. † 3375 IU of vitamin A activity supplied by 2.6 mg of beta-carotene. Water, Corn Maltodextrin, Sodium & Calcium Caseinates, Soy Protein Isolate, Sugar, Soy Oil, Oat Fiber, Medium-Chain Triglycerides, Safflower Oil, Natural & Artificial Flavor, Calcium Phosphate, Soy Fiber, Magnesium Phosphate, Potassium Citrate, Sodium Citrate, Potassium Chloride, Soy Lecithin, Ascorbic Acid, Choline Chloride, Taurine, L-Carnitine, Gellan Gum, Zinc Sulfate, dl-Alpha-Tocopheryl Acetate, Ferrous Sulfate, Niacinamide, Calcium Pantothenate, Manganese Sulfate, Copper Sulfate, Thiamine Hydrochloride, Pyridoxine Hydrochloride, Riboflavin, Vitamin A Palmitate, Beta-Carotene, Folic Acid, Biotin, Chromium Chloride, Sodium Molybdate, Potassium Iodide, Sodium Selenate, Phylloquinone, Vitamin B12, and Vitamin D3. Water, Corn Maltodextrin, Sodium & Calcium Caseinates, Soy Protein Isolate, Sugar, Soy Oil, Oat Fiber, Medium-Chain Triglycerides, Natural & Artificial Flavor, Safflower Oil, Calcium Phosphate, Soy Fiber, Magnesium Phosphate, Potassium Citrate, Sodium Citrate, Potassium Chloride, Soy Lecithin, Ascorbic Acid, Choline Chloride, Taurine, L-Carnitine, Gellan Gum, Zinc Sulfate, dl-Alpha-Tocopheryl Acetate, Ferrous Sulfate, Niacinamide, Calcium Pantothenate, Manganese Sulfate, Copper Sulfate, Thiamine Hydrochloride, Pyridoxine Hydrochloride, Riboflavin, Vitamin A Palmitate, Beta-Carotene, Folic Acid, Biotin, Chromium Chloride, Sodium Molybdate, Potassium Iodide, Sodium Selenate, Phylloquinone, Vitamin B12, and Vitamin D3.